Although almost completely forgotten by history, William Dobson was the first truly great British painter. He was an artist of huge importance because he witnessed and recorded one of the crucial moments in British history, the English Civil War (1642-1646). He was there, living it, capturing its spirit and painting the people involved. Dobson had an exciting life to go with his exciting talent, but it was tragically short and fateful. He was born in London in 1611 and baptised on March 4th in St. Andrew Church, Holborn. He came from a wealthy family but his father squandered his fortune on what contemporaries described as ‘licentious living’. Around 1625 Dobson was forced to start making his own living, and he set about an occupation not considered suitable for an English gentleman: a painter. Initially, Dobson trained with the painter and print seller William Peake, learning the trade of art dealing. After completing his seven-year training, around 1632, he went to work for the German artist Francis Cleyn, a decorative painter, book-illustrator and designer of tapestries. It is possible that Dobson collaborated with Cleyn on the surviving tapestries at Ham House. Around this time Dobson began acquitting himself as an aspiring artist, gaining access to the King’s collection, where he studied great works by Van Dyck, Titian, Tintoretto and Veronese. One story goes that Dobson’s neighbour was Abraham van der Doort, Surveyor of the King’s Pictures, who granted him access. 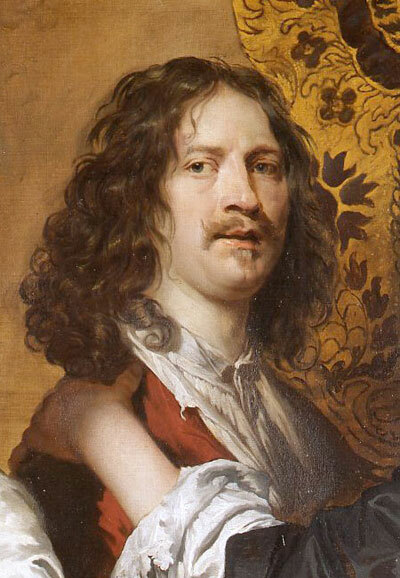 Another says that Dobson was actually a pupil of Van Dyck, the King’s official painter. But if Dobson really was Van Dyck’s pupil, he was determined to impose his own style. Unlike Van Dyck, Dobson would not flatter his subjects. In 1642 Civil War broke out in England and tore the nation apart – Parliament versus the King, Puritan versus Cavalier. Charles I had become a deeply divisive monarch as the result of unpopular policies and his claim to be God’s representative on earth: a divine ruler. Van Dyck had been the perfect painter to record Charles I’s Golden Age, but he was not the man to paint the Civil War. Fate stepped in and Van Dyck died in December 1641, just a few weeks before the outbreak of war. For Dobson, the timing was fortuitous. The King needed a painter, and there he was: fully trained, unusually talented and raring to go. Dobson moved to Oxford to a studio in St. John’s College where he began to paint. His art was fast and wristy, but the number of portraits he created in Oxford is still astonishing. He painted courtiers, haughty administrators, poets and men of letters, politicians and diplomats, and family supporters. But above all, Dobson painted the soldiers, Royalist heroes and the Cavaliers. From about 1642 to 1645 his paintings are marvellous examples of English Baroque, full of rich colour and detail, presenting strong characters determined to prevail amidst the turmoil. But as the Civil War progressed Dobson began to run out of artistic supplies. From 1645 his portraits begin to capture the insecure and worried glances of those still left in Oxford, suffused with a melancholy sadness reflected by a thin application of paint. Dobson’s art was incredibly inventive for the times. He nearly always used a square canvas, with most of his sitters painted from the knees up, making them appear chunky and solid. This was in stark contrast to the tall and elegant portraits produced by his predecessor Van Dyck. He also developed a unique style of allegorical portrait, using symbolical references to mark who his sitters were. Dobson almost always considered the life of his subjects and gave them appropriate symbols, something that was unprecedented in British portraiture. With the Parliamentarians closing in, the King abandoned Oxford in the small hours of April 27th 1646, disguised as a humble servant. A few weeks later the city fell and those Royalist supporters who remained, among them William Dobson, discretely returned home. Back in London in the summer of 1646, Dobson attempted to continue his career, with his name appearing in the records of the London painters’ guild. However, three months later he was dead with no description of his passing, only the bare fact recorded in the parish records: October 28th 1646. According to his first biographer, Richard Graham, Dobson died in poverty at his house in St. Martin’s Lane, aged just 35. He was buried in his local church in St. Martin-in-the-Field, but today there is no indication of his grave. Dobson was a painter of conspicuous talent, the first truly important British artist. Destiny singled him out to give witness to one of the most tumultuous events in British history. As soon as it was over, destiny intervened again. He was dead. In a tragic way it was the perfect career.